I wrote about this back in 2010, but I feel it needs a revival after seeing yet another story in the local media referring to the once-proposed rail project between San Antonio and Austin as “light rail”. This is incorrect– that project, known as Lone Star Rail or “L-Star”, was to be a commuter rail line, not light rail. It’s not just semantics– there is a big difference in the two. Unfortunately, “light rail” continues to be a buzzword that people around here use without fully understanding what it actually means. 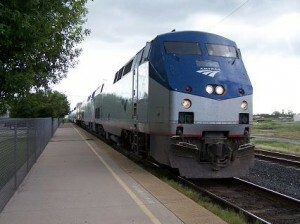 Commuter rail typically uses large, Amtrak-style trains running at fairly high speeds on completely dedicated right-of-way with limited, widely-spaced stops and schedules more oriented to twice-a-day commuters, meaning midday and weekend service is infrequent or even non-existent. 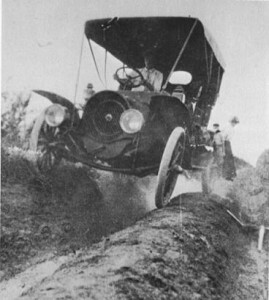 This was the type of service planned between San Antonio and Austin. 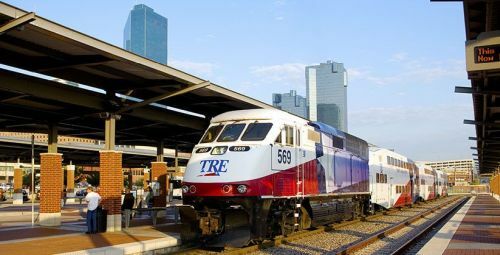 The TRE train between Dallas and Ft. Worth is an example of such service here in Texas. Light rail (LRT), on the other hand, uses smaller, lighter trains (thus the term “light” rail) that more closely resemble large streetcars than they do “regular” trains, run at somewhat slower speeds, often run in dedicated rights-of-way but sometimes run on streets, have rather closely-spaced stations or stops, and have fairly frequent schedules and short headways (time between trains) all day long. This is likely the type of rail service that would be built by VIA in San Antonio if they build a rail line someday although there has been some discussion of building a commuter rail route using the rail line between downtown and the RIM. 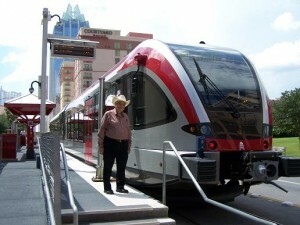 DART in Dallas and Metro in Houston are examples of LRT in Texas. 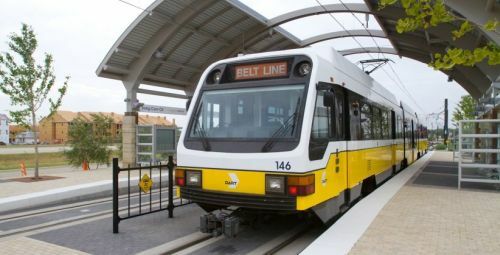 Some other differentiations: Commuter rail trains are much longer than LRT trains and connect the central city to the suburbs while LRT trains typically run mostly within the main urban area (in San Antonio, that would be within Loop 1604.) Also, commuter rail trains are frequently diesel-powered, while LRT trains are almost always electric-powered. Of course, just to confuse things, there are exceptions, including one just 70 miles up the road (or track as it were): Austin’s MetroRail commuter rail service uses diesel-powered LRT-style trains for what is actually a commuter rail service. Hopefully this will put an end to the frequent misuse of “light rail” around here to refer to the possible rail service between SA and Austin, although I doubt it. Arguing about light rail is rich with possibilities. And it’s so easy to galvanize issues: Do we spend hard-earned taxes on transit or roads? Do we revive downtown cores or unclog asphalt arteries to suburbs? What neighborhoods should get the coveted rails or lanes? The right strategic mix is the sane solution, but agreeing on the right blend can drive decision-makers batty. To wit, the 2000 light-rail election in which VIA Metropolitan Transit was buried first by critics and then by voters. The 2-to-1 defeat silenced local rail advocates for almost a decade. But now VIA’s latest rail plan – a $180 million project to build a 2.7-mile east-west streetcar line through downtown as well as construct two major transit centers and two suburban bus park-and-rides – seems to be careening around the same pitfalls. You’ll likely pay more than $3 a gallon for gas next spring. But you’ll probably keep paying the same 18 cents per gallon federal gas tax — which has lost more than a third of its purchasing power since it was last raised in 1993. The roads you drive on will get worse. Transit will face ongoing challenges. That’s what appears in the fog ahead as Republicans take back the U.S. House amid the worst financial crisis since the Great Depression. Feeding voter sentiments are widespread fears about rampant spending and taxing. Incoming Transportation Committee Chairman John Mica of Florida told reporters last week that the gas tax will go nowhere — which mirror’s President Obama’s position — and that he wants to reconsider recent high-speed rail grants. But Mica also said he’ll grab hold of a stalled $500 billion six-year transportation reauthorization bill, now a year overdue, and work to push it through. The bill is twice as much as the 2005 law and twice as much as what the gas tax will bring in. Even so, the massive bill still falls some $150 billion short of just being able to maintain what we have, indicates a report headed by two former U.S. transportation secretaries. And that’s just the federal gap — states and local entities have holes too. We are facing an “elegant degradation” of our transportation system, the report warns. It will be slow, sure and very costly. Planners and pundits have long decried Interstate 35 as Texas’ worst highway. Notorious traffic backups and numerous crashes on I-35, especially on the stretch from San Antonio to Austin, have spawned big-ticket projects such as the SH 130 tollway and Lone Star commuter rail. Putting two and two together from such thinking eventually led to the now supposedly defunct Trans Texas Corridor. But more big plans are in the making. Can buses look and operate more like light rail? VIA Metropolitan Transit officials think so. And now the public can peek under the hood of a plan to spend $57 million to speed up bus travel and make trips more comfortable along Fredericksburg Road. The study says buses could scoot along 30 percent faster on nine miles between downtown and the Medical Center, two prime job centers anchoring one of VIA’s busiest routes. More than a fourth of the area’s 79,000 residents depend on transit. 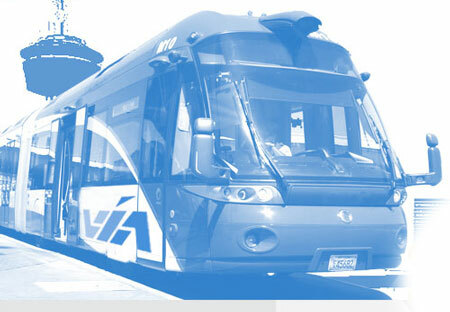 The cost for bus rapid transit, as it’s called, includes traffic signal controls to give buses more green time, faster ticketing, sidewalk-level boarding, two roomy transit centers and eight enhanced stations. The hope is that developers will create walkable, mixed-used hubs around the stops. The cost does not include dedicated bus lanes on part of the route, as proposed in previous plans that put the tab at around $100 million. 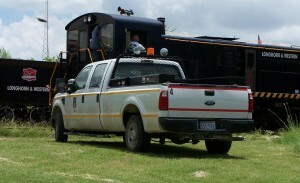 Construction is supposed to start this year, with service starting in late 2012. One in four big-city commuters walk to work, ride bicycles, use transit or at least share car rides with other workers, a new study says. A good number even stay home to work. In other words, 24 percent of Americans in the 100 largest metro areas don’t drive solo to work, according to “The State of Metropolitan America,” a report released this week by the Brookings Institution. And though a whopping three-fourths still drive alone, that portion has been shrinking, says the report’s 12-page commuting chapter. TRANSIT RIDERSHIP: went up for the first time in 40 years, reaching 5 percent in 2008, though that’s still shy of 5.1 percent from 1990. DRIVING SOLO: slid down slightly, mostly in 2007 to 2008, the first year of the Great Recession and a time of shockingly high gas prices. Austin led the nation’s biggest cities with a 3.6 percent drop. 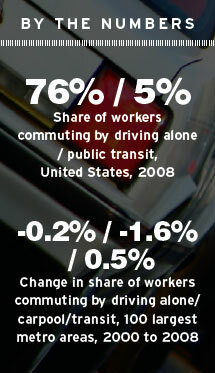 CARPOOLING: dropped to 11 percent, less than the 12 percent from 1970. TWO-WHEELING: by bicycle and motorcycle rose slightly, to 1.7 percent. WALKING: declined to 2.8 percent, down from 7.4 percent in 1970. TELECOMMUTING: jumped to 4.1 percent. El Paso is third in the U.S. for a 3.2 percent increase in solo driving and second for a 5.2 percent decrease in carpooling; McAllen ranks in the top five for both the percentage of commuters who carpool and those who quit carpooling; and Houston is fifth for loss of transit share.